I was in travel mode last week and forgot to add a blog topic for the Knock Outs – the third stage of this competition. However, I was incredibly happy to see that Sawyer Fredericks was selected to advance to the live shows. Anyone else here think that Sawyer is going to run away with the top price? I absolutely love this rooted young man who embraces artistic originality and passion in his vocal style and substance. He is quite a find and, whether he wins or not, destined for a lucrative career in this business. However, there are still some Knock Out Victors to be acknowledged this week, the final show airing on Monday, March 30th at 8:00 PM on NBC. 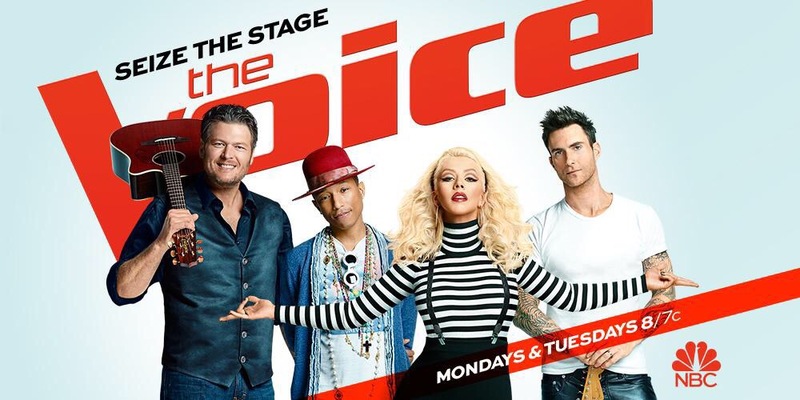 Then, on Tuesday, March 31st, NBC will air a special presentation, “The Road To The Live Shows”, focusing on the best performances from The Voice Season 8. Next week, the Live Playoffs begin and this is when the viewers have their say via votes. Finally! If anyone, anywhere, has spoiler information for this week’s knockouts, please contact me via the my Contact Page. And thank you in advance. Don’t forget to download The Voice iPhone App here or the iPad App here. By doing so, you can cast your votes nice and early once the live shows begin in April, thus ensuring that your favorite moves on in the competition. Comments are now open for business. Fill me in on the highlights and lowlights of Tuesday’s show. I will check back later. Also, iTunes has I’m a Man of Constant Sorrow (The Voice Performance) – Single – Sawyer Fredericks as well as his Knockout Performance of Collide. Sawyer is also one of my favorites this season but he has some very strong competition left in this group. His teammate and fellow young singer Mia Z has a natural feel for singing the Blues. Another young singer, Koryn has a beautiful voice and has the R&B lane covered. Among the grownups is the powerhouse Rocker chick, Sarah Potenza and the lady who is billed to be a country sing who is turning her interest toward “Soulful Pop,” Meghan Lindsey. I like all of these singers but I think that Meghan is the other one to watch because, even though they have touched on these things about her, they have been a little less than forthcoming about her history. I watched Meghan and her partner at the time win the second season of CMT’s “Can You Duet.” They were very good right out of the box and all of the judges were in their corner from the beginning. One of the judge / mentors for that show was Scott Borchetta, who of course is now the mentor on American Idol. As the head of Big Machine Records, he was also the industry representative who signed them to a recording contract where they had fair success with a few charting songs and won a CMA award for new group of the year I think. As they have said on the show, she opened for Blake before becoming part of the Steel Magnolia duo and the funny thing is that she has always sung in the style of a Soul singer, not a country artist so the big changeover to soulful pop is fabricated. Combine the well established entrance into the industry with the fact that she has a really nice voice and can wring a gallon of goose bumps out of a song and has a good stage presence, she begins to stand out from the rest. She should also perform very well with Blake in the team group numbers as well as with teammate Sarah Potenza, so I expect a powerhouse performance from them. There was also the obvious ploy of all of the judges except Blake (who she had opened for during an entire concert tour) turning for her during the blind auditions and then Blake stealing her after the battle round that she should have won. It seems like they have gone to a lot of trouble for just another throw away contestant. I think Sawyer will have trouble shining in his group numbers with Pharrell. His teammate Mia Z is more Pharrell’s style and even though Sawyer is a phenom, I think the group numbers have to be tailored to suit him or he won’t look good in them. His voice reminded me of a cross between the late Jim Croce and the late John Denver last week but of course, in addition to singing, they were both prolific writers of good songs and, particularly Jim Croce, fine musicians. It will be interesting to see what becomes of him. They are pimping him pretty heavily as well. Unfortunately, they will begin cutting through this great group of singers before long like mowing your lawn in the summer. I hope several of these singers find their way into the industry. Josh and India were among the best from the blind auditions so I’m glad, but not surprised that they have made it through. Lexi was a surprise tonight. I’m not sure I recall seeing her before. Each team except for Adam’s has two strong contenders as well as two to three others who will be entertaining to watch. Josh is the only contender I see on Adams team. They have sent home better talent this year than they have had in some seasons. Thank you Gene for bringing back some good memories with the mention of John Denver and Jim Croce. I have been popping in and out of The Voice but have seen some performances on Sunday. I was impressed with Sawyer but also liked Mia Z. I have been watching Dancing With the Stars and American Idol as a priority. I do appreciate your comments and brining us up-to-date. Rosanne, I hope you enjoyed your runaway from home. We were celebrating Raster a week early and it was snowing outside. Come on Spring! Oops, sorry about typos. I meant EASTER! I agree with Gene. Adam’s team is the weakest. So much great talent that I can’t even pick a front runner yet! I’m glad you had a good vacation and have returned safely. I hope you have time to watch the rest of this season of the Voice. It’s really a good one so far. You had me going there for a minute. I thought I had forgotten to send out “Raster” cards or maybe that is part of the Festivus holiday season. It went right over my head that you were referring to Easter! We were so fortunate to come up in an era with so many different styles of great music, weren’t we? I pay special attention to young artist that show an appreciation for the music of that era. Mia Z had me when she auditioned with BB King’s The Thrill is Gone. I also like to see the contestants that just love good music and you can see them rocking out or cheering loudly for there opponents in the battle rounds. The lady that competed against Koryn shouted out “sing girl” when Koryn finished her song and ran over to hug her. Josh and Mia did similar things during their knockout rounds. Good stuff. It wouldn’t hurt my feelings if any of these folks win. It’s been good entertainment so far and hopefully it’s providing a platform for some of them to advance there careers. I believe you could create a pretty good singing competition from the singers eliminated so far this season. You mentioned that you are watching DWTS. They are having an outstanding season as well. Rumer and Nastia are outstanding, Willow is very impressive, especialy for her age and Noah, WOW, what can you say? He’s another local boy BTW I watch it live and record the Voice and Bates Motel. I don’t know why they cram so much into Monday nights though.